The Scottish Australian Mining Company’s plan of the Cadia Properties reveals some interesting details. 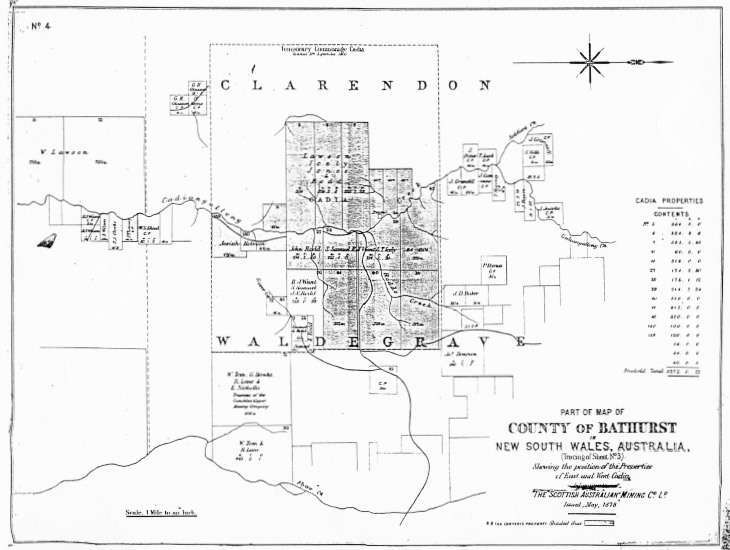 It shows the Common established in 1866, as a result of the petition by the Cadia miners and settlers, and the land within the Common, already alienated by that date. At the south-east of the mine properties, it shows the land excluded from the mine in 1864, when the Cadiangullong Consolidated Copper Mining Company was set up. Even in 1878, the surrounding bush was only partly occupied by conditional purchases. Part of William Lawson’s Errowanbang estate is shown to the south of the mine.